Squarespace is one of the most recognizable website builders. The platform claims to be good for different types of websites. It positions the software as a good option for blogs, small digital stores, and professional portfolios. It lets users build good-looking websites though it is far from being an easy tool. Squarespace is a good website builder whenever you need to stage your products in the best way. Actually, this is one of the companies that has clear understanding of how to present its product in the most favorable light and this is one of the things users appreciate most about it. All Squarespace-based websites look very cool, although, there are still some questions regarding the platform’s ease of use, especially when it comes to editing. There were many complaints over the last years that referred to the fact that Squarespace lacks some essential features. The latest platform’s update to version 7 seems to eliminate the core misses. The software comes with some new features like Cover Page Builder, an updated Style Editor, etc. We have reviewed the latest website builder version to come up with a detailed review to let you decide if Squarespace is good for your purposes. Great for portfolios, blogs and digital stores. Squarespace is quite easy-to-use for people with diverse web design background and experience rate. It comes with convenient, clear and logically-structured interface that has minimalistic design understandable to each and every user. However, when you access the system for the first time, you may find its dashboard a bit perplexing. It would be nice to make it more self-explanatory for first-time users. After the upgrade of the service, its usability has been improved, which becomes understandable right from the start. You don’t have to switch between the site manager and the preview mode each time you make the edits anymore. The advanced inline editing feature makes all the changes visible on a screen, which cuts down the web development time and makes the entire web design process simple and engaging. Being a WYSIWYG tool, Squarespace now lets you reach the required result much simpler that you’ve got used to. However, one thing remained unchanged: whatever changes you make, they are saved automatically and you don’t have an opportunity to preview them before website publication. This means that your visitors see these changes in the live mode, which triggers the necessity to be very attentive throughout the web design process to avoid the mistakes. Moreover, Squarespace has turned into a 100% WYSIWYG instrument. Although the editing process became faster and simpler, there is one crucial problem. All changes are saved automatically with no opportunities to preview them. It means that your visitors also see the changes right away. You need to avoid any possible mistakes from the start. 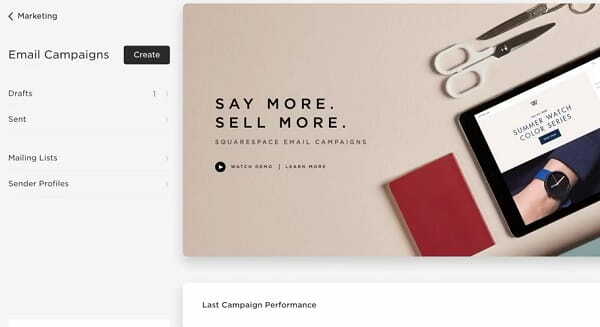 Although Squarespace positions itself as a drag-and-drop website builder, it is not actually a 100% drag-and-drop tool. If you will try to hover the mouse over a photo on the template, nothing will happen. Uploading media files and images is possible only after accessing the Style Editor. Once you are done, you are free to upload any of your website assets. It will take you some time to get used to the Style Editor. It is not very complicated though. The tool lets you move objects and sections to customize your page. Moreover, you can resize some of the site elements as well as relocate them. The only problem with relocation may occur depending on the template you choose. Some of them consider stick positions for each element with no opportunity to move or change them. Once you have chosen a specific type, other pages of the same type will automatically adopt it. For instance. You only need to edit your product page only once. 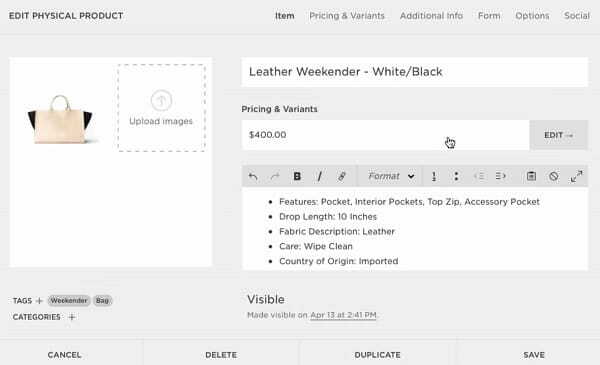 The Product Page settings will automatically apply to the rest of your product pages. Squarespace is a flexible platform although it does not have its own app store as well as third-party integration opportunities. On the other hand, the platform has enough built-in elements to come up with a functional website. eCommerce tools for restaurants and cafes. The software boasts an integrated tool to track visitors’ stats. There is a possibility to integrate Google Analytics or choose Squarespace Metrics App as an alternative. The website builder comes with inbuilt contact forms that are easy to customize and edit. You can add necessary fields or use the Contact Form Builder to create your own exclusive users’ accusation tools. The feature is a part of each Squarespace website though with some limitations depending on the plan. It includes a free SSL certificate and lets users integrate a shopping cart into any page no matter if it is a blog or a digital store. The platform ensures a decent product online representation. You are free to add different images to every item. They are clickable and provide a larger view through a lightbox with the detailed product description. Users can manage the product price indicating a regular rate as well as prices during the sale’s period. You can also add videos to the product page. However, they will be available under the “more info” section. Squarespace eCommerce examples – real online stores made by Squarespace users. Squarespace allows users adding up to 100 different item variations or SKUs. The entering procedure is rather simple although time-consuming, as there is no automated algorithm yet. However, it is still able to generate SKUs automatically in addition to a real shopping cart feature. The payment options are pretty limited. The platform uses Stripe to accept payments made with Visa and Mastercard debit/credit cards. On the other hand, you do not need to deal with shipping cost calculation thanks to shipping cost settings. You are free to set flat-based cost as well as rates defined by the product weight. The system delivers various loyalty options. They include coupon codes vouchers, fixed and floating percentage discounts, free shipping vouchers, etc. SEO capabilities look a bit limited. They actually offer some basic settings for product pages and blog sections. 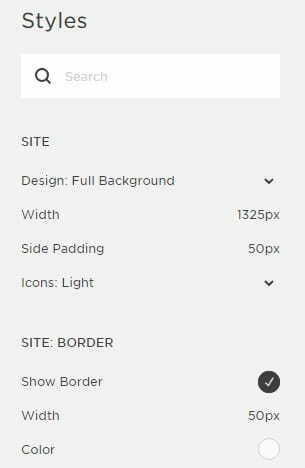 Unlike other website builders, Squarespace will automatically use the product name or post headline as the SEO title for the page. You are not able to manage it. The same thing I with your website title. It will be displayed on all pages as well. This fact will hardly make your website more SEO-friendly. The platform has a blog import feature making it easy to bring your WordPress, Tumblr or any other blog to Squarespace platform. Squarespace makes it possible to update the content any time you have such a need to further share it in the social networks, including Facebook, Twitter, Google+, Dropbox, Tumblr, Instagram, Dribbble, Linkedin, Pinterest, SoundCloud, Behance, Twitch, Yelp and more. Likewise, your website visitors will be able to share the content they are interested in by using the Share and Pin buttons integrated into the website. The website builder lets you get the insight into your visitors’ behaviour and website performance directly from the system dashboard. This is the place, where you will be able to look through reports that provide important data about your page views and visits, conversion rates, traffic number and sources, popular content and other crucial parameters. With Squarespace, you can embed Google Maps into your website to indicate your precise business location. This is also the place, where you can provide your contact data, feedback form, company history and other info you consider important and interesting for potential visitors. You can also let users quickly access this info even on the go by using the Mobile Information Bar. To keep your target audience aware of the upcoming events and special offers, you can integrate an online calendar into your website. This is where you can post the schedule of events, news, special dates and let users RSVP from your website (if you enable this feature). The events you add can further be shared across social media profiles to reach more users and popularise your business info. All Squarespace websites are securely protected by free 2048-bit SSL Certificates. They prevent unauthorized access of third-party users to your content, confidential info, payment details and other private information. This matters a lot for web store owners, who are especially concerned with their customers’ online safety. Squarespace provides you with a broad range of comprehensive marketing tools that help you effectively reach and grow your audience. Thus, the system lets you organize and hold email campaigns. Squarespace allows you import content (products, blog posts, social icons, logo, and mailing lists) from your website to draft emails in several minutes so that you could successfully save it for further use. When composing emails, you can integrate images to drive user attention, add links to relevant content, use buttons etc. You can also experiment with various style and color combinations that will match your company email branding most of all. Choose between over 30 fully-customizable starter layouts to present your products in the most favorable light, share updates with clients, send invitations to customers. A convenient drag-and-drop section will help you organize the content to effectively present it to the target audience. What’s more, you can manage your email marketing campaigns, save and publish drafts, review performance metrics and update the layouts from the centralized dashboard of any desktop and mobile device you are using. The website builder introduces its advanced Logo Maker that lets you create your own company logo to further integrate it into the website. From now on, you can design a unique logo with a few clicks only. Just provide your company name in the corresponding field, pick suitable elements, choose your logo style and publish it to get started. Having a company logo will certainly boost its reputation to make it stand out against its competitors. A convenient drag-and-drop feature makes it possible to add and organize images with no special effort and time investment. The responsive image loader makes it possible to drag the images directly from the desktop into your browser window, detecting and selecting the appropriate size to load for all types of screens and devices. Getty Images integration lets users select from more than 40 millions high quality images included into the collection. Due to the Image Focal Point Control feature, you can define the focal point of every image you are going to add, thus ensuring the best crop for resized images and thumbnails. All the images Squarespace offers can be edited right in the browser via the Adobe Image Editor – just pick the image, resize, crop, rotate and adjust its parameters with regard to your needs. What’s more, Squarespace comes with integrated Lightbox tool that allows for stunning full-browser-sized image presentation. If you plan to work on your website development with a team of co-workers, the service allows adding multiple contributors to the account. You can provide the selected users with access data to the Website Manager depending upon their statuses. The major access levels include Administrator, Content Editor, Billing, Reporting, Comment Moderator, Trusted Commenter, and Store Manager. Squarespace comes with a fully-integrated commenting system that supports threaded comments, which have individual like counts. It is possible to set all the submitted comments for moderation before they are displayed at the website. All the comments can be flagged as spam by website users. It is also possible to sort them by the publication date, popularity and other criteria. If there is such a need, you can enable/disable anonymous commenters. An important aspect is that the system has integrated filters that automatically block abusive comments in the real-time mode. Squarespace is more focused on the quality of its templates rather than quantity. It does not deliver hundreds of themes like some other popular website builders. The website builder currently offers 40+ templates that look very professional and are mobile-friendly as well. Wedding and bridal websites, etc. The platform makes it very easy to come up with a good-looking cover page. All you need is to fill the page with necessary blocks, edit colors and add some texts, images or other media files. The feature works perfectly for one-page site building process. It is also good for other purposes like “error page” or “coming soon” page. The platform delivers dozens of ready-to-use Cover Page designs (currently 29 layouts) that are fast and easy to customize. The option is available for users with the “Business Plan” only. They need to access the Developer Platform to work with HTML/CSS and change template design. The CSS editor comes with enough instruments to edit site menus. Do not worry in case you fail to create the look you wanted. The platform has the reset option that will drive your site back to the original theme. A great tool with the Logo & Tile editing feature in addition to the link back option in case you want to transfer the site content to a new template. Squarespace makes it possible to switch the templates during the web design process as well as to work on several designs at a time. Each template includes customizable content areas, which use Squarespace Layout Engine and Content Block system. Footers, pages, sidebars and blog posts can use all the available content block types, including audio, video, markdown, text and more. The website builder partners with Typekit and provides users with a free choice of high quality fonts to improve project design. There is also access to the free Google fonts library that can be used without any code embedding at all. Apart from that, Squarespace makes it possible to create stunning visual experience by integrating video background into any template of your choice. The website builder provides enough ways to get in touch with the support team. Users can opt for a live chat available 24/7 as well as send a request via email support. Additional sources include Tutorial Resources with plenty of handy videos and articles to resolve any issue. Community Forum might also come in handy, as there you can ask real users questions or simply find useful information in a particular thread. Squarespace also offers 24/7 ticketing system, extensive FAQ section, opportunity to join system webinars as well as get access to the informative Help Center. The latter offers valuable knowledge base, helpful guidelines and even workshops. The platform does not actually have a free plan. However, users can try all of its functions and features before subscribing thanks to a 14-day free trial. It does not require any personal info whenever you decide to sing up and start the trial. ✓ 3% sales transaction fee. ✓ 2% sales transaction fee. ✓ Real Time Carrier Shipping. All plans include a free domain name and hosting. If you already have an existing domain, you need to appoint it to Squarespace. Separate plans for websites and eCommerce. The platform usually introduces new updates aimed at improving users’ experience. However, Squarespace developers still have some work to do considering some system’s hits and misses. ✔ Greatly designed responsive templates..
✔ Extensive image editing options. ✔ eCommerce and blogging support. ✔ Code embedding enabled. ✘ Style Editor is not very easy to use. ✘ Lack of preview mode. ✘ Too expensive eCommerce plans. We have examined different popular website building platforms and compared them to Squarespace. The overview provides a clear vision of platform’s hits and misses in front of the main competitors. Editing Squarespace websites can be dull and daunting at the same time. The platform is hardly focused on newbies despite the fact it is positioned as a drag-and-drop builder. You can find some simpler alternatives like Wix with more user-friendly intuitive interface. Summing up, Squarespace certainly deserves that popularity and recognition among website owners. The platform is flexible and functional enough to build sites of a different type. It comes will all necessary website-building tools in the pack to create a brilliant website that refers to creative industries. It is good to know that Squarespace development team strives to improve the system regularly introducing new updates. However, there is still much work to do. The platform certainly lacks flexibility when it comes to SEO settings and functionality. They still need to do something about the Style Editor to present it in a more user-friendly way. Despite all drawback, it is clear why thousands of users opt for this website building tool despite available alternatives. Still the best way to understand if Squarespace meets your expectations is to test the system by yourself and decide whether it suits your objectives or not.